Shawn and his wife Lindsay with their children (from left to right) Ellie, Jake, Lauren, Max. From all appearances, Shawn Plummer is your classic Canadian - born and raised in the small city of Chilliwack, BC, Shawn is the youngest of three brothers and grew up on the ice playing hockey every winter, while spending the summers at his grandparents’ cabin on the lake. Shawn married another native BCer, Lindsay, and together they have four adorable children (just look at the photo!). But appearances can be misleading. After graduating from university with a Business degree, Shawn, unlike many of his childhood friends, took off to South Korea for two years to teach English. It was in Korea that he got his first real taste for cross-cultural living. 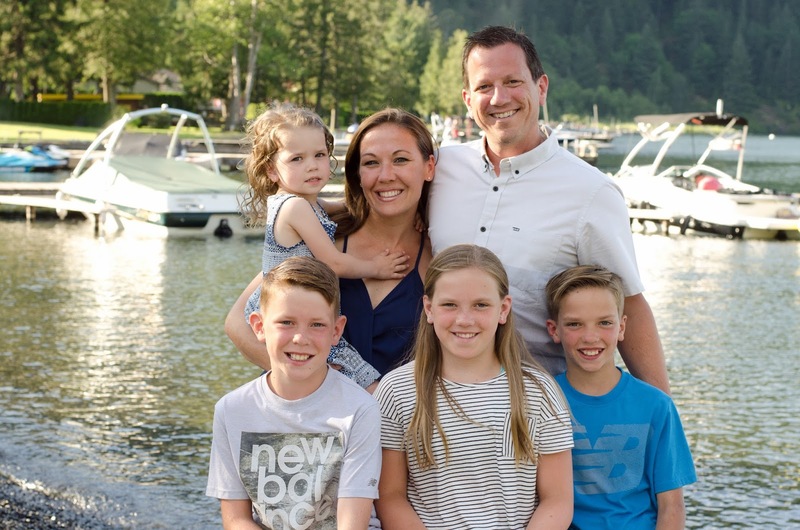 He returned to Canada to attend UBC for a teaching degree and readily admits the best thing he got out of the program was meeting his wife, Lindsay. Shortly after graduation, Shawn was invited by Samaritan’s Purse to apply for a short-term position overseeing emergency relief in Mozambique. Once again, Shawn boarded a plane, but this time, he never looked back. Shawn shows a friend in Burundi where they are in relation to to Canada. Shawn in Cambodia with Country Director, Linly (far left), and two other FH Cambodia staff members. During his eight year tenure at FH, Shawn has led partner visits to nearly all of the countries where FH Canada works, and has formed friendships with many of the FH field staff. It was important to him to see the work first-hand, especially as he became more involved in FH Canada’s Child Sponsorship program. Shawn gets a thumbs up from the kids in Burundi. When asked what some of the upcoming highlights will be in the first year of his presidency, Shawn cites FH’s International Medical Equipment Distribution (IMED) program transition, calling it an “exciting and bold move.” FH Canada has just concluded 17 years of IMED programing and is now shifting its focus to become more intentional in supporting the FH global Relief and Humanitarian Affairs team. Other highlights include two field trips - one to Kayanza, Burundi for a community graduation with Sherwood Park Alliance Church, and one to Uganda with the FH Board. While in Uganda, the team will have the opportunity to travel up north and see FH’s work in the South Sudanese refugee camps. Shawn also looks forward to upcoming Christian band tours promoting FH Child Sponsorship, and to increasing FH Canada’s pledged support to their partnered communities. Recent partner trip to Cambodia (from left to right): Shawn, Bill, Shelaine, Ben, Dustin. 10 things we bet you didn’t know about our new President! Um...do you have a license to operate that machine? 1. What’s the longest layover you’ve ever had? 72 hours in Chicago. Massive snowstorm, missed our flight to Brussels with a connection to Liberia, and the flight only went every three days. Classic Chicago. 2. What’s the strangest thing you’ve ever eaten? Flying ants in Sudan..or were they winged termites? Oh, also camel in northeast Sudan and live fish in Japan (you could feel them swimming in your stomach - totally weird). 3. Do you like winter or summer sports? 4. What’s the most embarrassing thing you’ve ever said in a foreign language? 5. What’s one of the funniest things that’s ever happened to you? 6. What’s the craziest public transportation you’ve ever taken? Probably camels in Mongolia and donkeys in Egypt - super uncomfortable. 7. Who’s your favourite hockey team? 8. What was one time you thought you were going to die in a foreign country? Ooh, one hairy flight out in Darfur with some crazy Russian pilots. But there was also that ride in Kathmandu, clinging to the roof of a bus as we whipped around sharp mountain bends on narrow roads. 9. How do you take your coffee? 10. What was the happiest moment of your life? When my kids were born, hands down. And if I’m really honest, it’s probably when my twins were born because there was just so much craziness going on. Aaaand, that’s a wrap! Stay tuned for more from President Plummer on our blog coming soon!